We all have our little manias, and I am about to share some of mine. The following are five dumb little things I do that make me feel thrifty and somewhat less wasteful in a world where you can’t seem to help using far more stuff than is necessary or even decent.They may not save the world, but they save my sanity sometimes. 1. Dilute your dish soap. Stop using so much dish soap! Stop wasting so much water! Today’s soaps are so intense and dense that they make much more lather than you need to clean and then it takes oceans of water to wash the soap off. I save the last dish soap container and when I buy a new one, I fill the old one halfway with soap liquid and half with water. The result? Easy cleaning, less water and less waste. Also, I soap things up before running the water to rinse. There’s no reason to spill water down the sink while you are soaping up the dishes. Ninety percent of your energy costs in laundry go to heating the water (get some figures here) and today’s detergents are so powerful that there you don’t really need hot water to get clothes clean. There are coldwater options, but I use Seventh Generation High Efficiency (yeah, I know, I’m a little kooky about the environment) and wash most stuff in cold water. Unless it’s really grimy, it doesn’t seem necessary to use hot. Having said that, it is said that hot water removes allergens better, so you do have to weigh your options if you have allergies in the family. Found Vegetable Stock: leave out the onion peels for a lighter stock! 3. 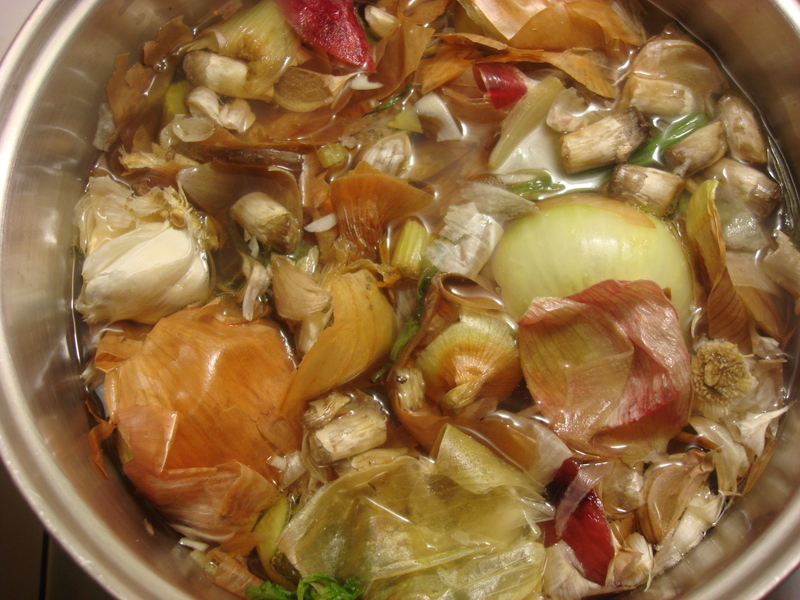 Use your vegetable scraps to make your own found stock. I save garlic peels, carrot tops, celery leaves, mushroom stems, etc. in a gallon freezer bag in the freezer. 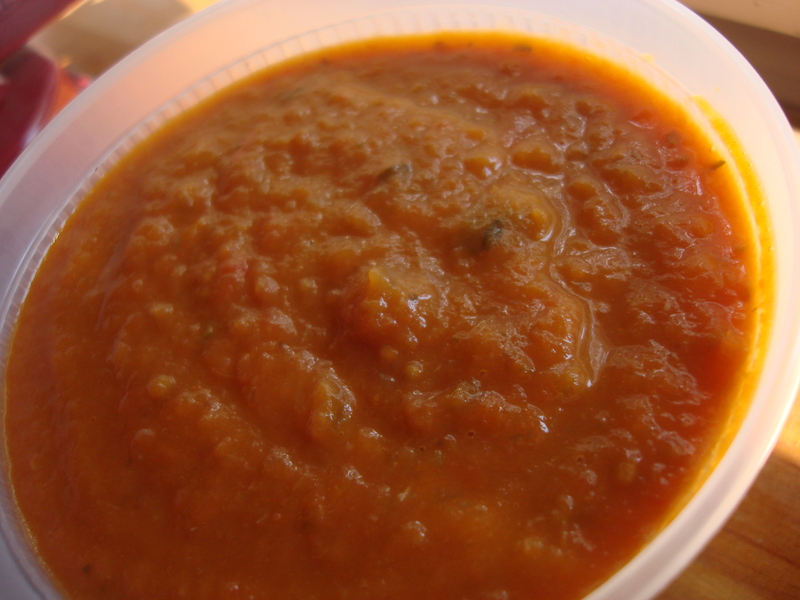 When it’s full, I dump it in a pot with an extra peeled onion sliced in half, cover with water, and simmer for an hour. Avoid cabbage, broccoli, and other Brassica family members. I am now experimenting with apple cores and will let you know! Or simmer the leftover bones from roasted chicken with some peppercorns, herbs, and a peeled onion, cut in half and studded on each half with a single clove, for handy chicken stock. You can strain them off after an hour (or more for the chicken) and store in the freezer for up to three months. 4. Use the cooked pasta to get the last of the sauce out of the jar. I don’t often use jarred pasta sauce, but when I do, I like to get as much of it on the pasta as possible. So once I have cooked the pasta and poured out the sauce, I put a scoop of cooked pasta in the jar and swirl it around to grab all the sauce clinging to the jar. I do the same for the containers of my own home-made sauce. Use cooked pasta to get the last of the sauce out of the jar or container. I also reserve about a half cup of the pasta water to add to the sauce if I want to stretch it or it seems too dry. Keeping a mug or measuring cup near the sink to remind you before you pour all the water down the drain. Pesto ice cubes! Great for defrosting in a flash! 5. Use ice cube trays or plastic pint containers to freeze extra liquids. It annoys the hell out of me that buttermilk (or the synthetic stuff they call buttermilk in my local supermarkets) comes in quarts, when all I usually need is a cup for whatever I am baking (cornbread, usually). Then I have all this buttermilk and no use for it. So I pour it into a pint container, as it freezes very well. 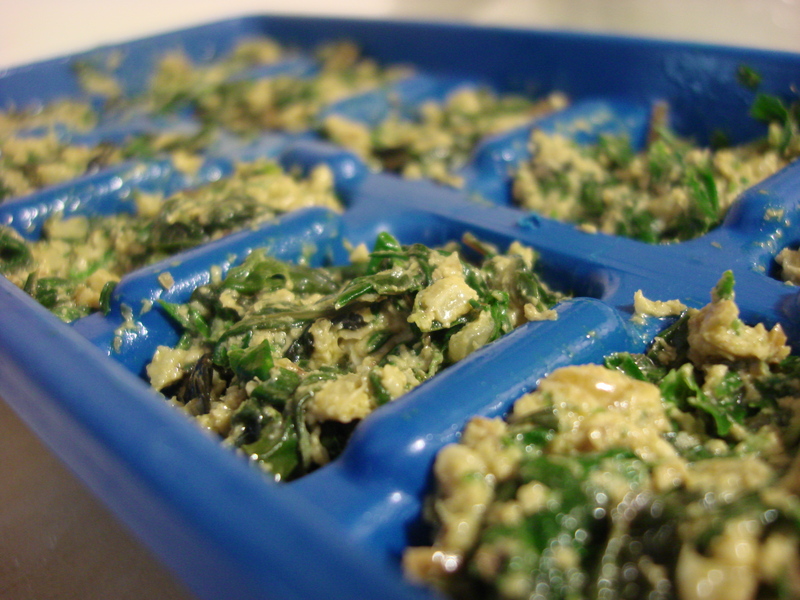 I use ice cube trays for extra pesto, sofrito, and even juice, so it keeps longer! ← Pilfered (with Permission), ¡Giovanna’s Tortilla española! paper towels are what gets to me… so i dry them by hanging them up (when they are just wet from drying hands) and use again for something that needs to be cleaned up from the floor (like dog muddy feet). I am so with you! I almost put that one in!!! Excellent tips indeed. Recently, due to all the cutbacks and gloom here in Ireland, I mentioned to my accountant that I could save 10% on fuel simply by turning off the air conditioning. He looked at me over his glasses and said “Turn it off? You mean it has been turned on?” He is a professional tightwad. I admire him. Oh that’s very funny! I confess that this brutal summer, for the first time I used air conditioning on a regular basis. Don’t like it, but there were some awful days…. Re: getting all the pasta sauce out of a container or jar — I just add a bit of water to the jar, screw the lid back on and hake, shake, shake. Pour out into your sauce pan. Re: chicken stock. I freeze my chicken carcasses until I have time to make a big stock pot full. I simply pop all the frozen bones, bits, skin, etc into the pot and add your flavourings and water. You can pump up the flavour of your stock by roasting the carcass(es) before preparing the stock. I will try your suggestion re: dish-washing detergent. Seems very sensible to me. I do a similar thing for eye-glass cleaners. I kept the original empty pump, filled it halfway with window/mirror cleaner and topped it up with water. Works like a charm. These are some terrific tips! I especially like the chicken carcasses…Thanks for the input! A ver si te funciona! I was thinking about how silly it is that the buttermilk comes in big containers. I think I will use your tip and try freezing some. Thank you! Let me know how it goes! And feel free to add your tiny tips here!